A significant time of year is upon us. Southern California finally grew tired of record heat, and now the mornings and evenings are chilly. This is a negative for the cats because Staff must sometimes close their beloved windows; this is a positive for the cats because Staff can now open the blast shields. The curtains must stay permanently closed all summer to keep the brutal sun from incinerating the living room. 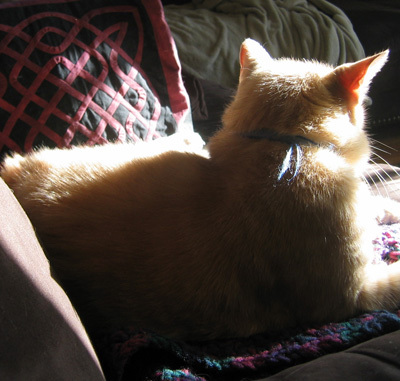 Now the sun is friendly and happy, and Jeff claims the couch spot each morning to bask. El Jefe is most pleased. And warm. 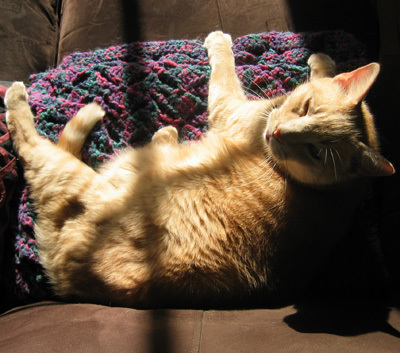 No doubt El Jefe is most pleased with his orange glow, as well as the afghan to keep him warmed up. We’ve had similar weather (finally!) here in Phoenix, my own two feline owners have ordered me to keep the outside view available at all times. Naturally, I complied without question. 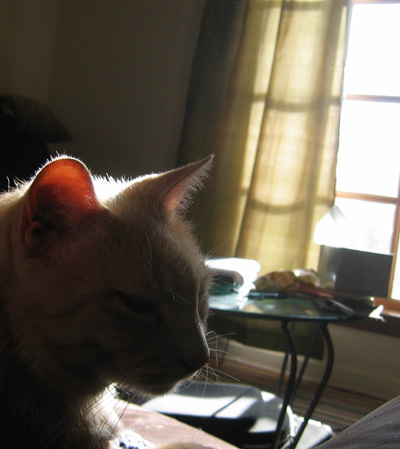 Jeff looks particularly beautiful tinged with sunlight. I am glad he is pleased and warm. A displeased and chilly Jeff would be terrifying. Good on ya Jeff! However, here on the wrong coast it’s time for Evil to sleep under the blankets on the bed.